This morning The Washington Post reported that the United States plans to embed American intelligence agents in Mexican law enforcement units along the border city of Ciudad Juárez in an effort to combat illicit drug trafficking and the strangle hold that the Mexican drug cartels have throughout Mexico. And while combating the drug trade in Mexico – especially along the U.S./Mexico border – is a cornerstone of our bilateral efforts to bring a modicum of stability to the country, the United States is also making environmental cooperation a priority along the border as well. Last week, my colleagues Christine Parthemore, Commander Herb Carmen and I were on location in Colorado Springs visiting with folks at U.S. Northern Command (NORTHCOM) to discuss all things energy and climate change-related. One interesting program that we learned about during our visit though is an ongoing bilateral, interagency effort that includes NORTHCOM, the Environmental Protections Agency (EPA) and several U.S. and Mexican state and federal agencies around environmental preparedness, protection and response along the southern border. Rapid population growth in urban areas has lead to unplanned development, greater demand for land and energy, increased traffic congestion and waste generation, overburdened or unavailable waste treatment and disposal facilities, and more frequent chemical emergencies. Residents in rural areas suffer from exposure to airborne dust, pesticide exposure, inadequate water supply and waste treatment facilities. Projected population growth rates in the border region exceed anticipated U.S. average growth rates (in some cases by more than 40 percent) for each country. By 2020 the population is expected to reach 19.4 million. Border residents suffer disproportionately from many environmental health problems, including water-borne diseases and respiratory problems. Over the last several decades, the United States and Mexico have engaged in opportunities to stem the tide of this severe environmental degradation (see a more robust assessment of the environmental issues here). In fact, in 1983, the United States and Mexico signed the Agreement on the Cooperation for the Protection and Improvement of the Environment in the Border Area, abridged as the La Paz Agreement. 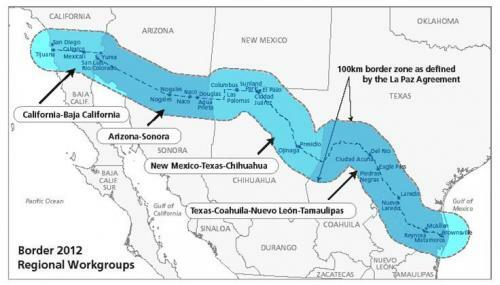 According to the agreement, the United States and Mexico agreed “to the fullest extent practical, to adopt the appropriate measures to prevent, reduce and eliminate sources of pollution in their respective territory which affect the border area of the other,” which would be defined as the area within 100 kilometers of the inland and maritime borders (see photo). One such measure, as our hosts at NORTHCOM pointed out to us, is the Border 2012 program. This ten year agreement, initiated in 2002, aims to “protect the environment and public health in the U.S.-Mexico border region, consistent with the principles of sustainable development.” Under Border 2012, NORTHCOM, in collaboration with the EPA, Mexico’s Attorney General for Environmental Protection, (PROFEPA) and several other state and federal agencies, has been helping to build capacity with its Mexican partners around environmental emergency response; specifically around the capacity “to support and expand sustainable Mexican response capability to address HAZMAT [hazardous materials] incidents and to protect the health and environment of the U.S.-Mexico border communities.” Under this initiative, NORTHCOM and the EPA are helping to “train and equip first responders in the Mexican major sister-cities along the U.S.-Mexico Border.” Since 2007, NORTHCOM and the EPA have provided $500,000 a year toward building partnership capacity, including $250,000 in hazardous materials technician training for Mexican border first responders and $ 250,000 for HAZMAT response equipment. Challenges posed by homeland security within North America and Europe exceed the capacity and authority of any one level of government. Protecting our respective homelands against today’s unique threats calls for a truly integrated approach, bringing together the resources of all levels of government. Key to success for North America is a proactive engagement between military and interagency across all levels of government and with international partners/countries. Indeed, building the capacity and capability in Mexico to respond to environmental hazards is an excellent example of this proactive, civil development. Such sustained engagements have the ability to professionalize Mexico’s first responders, build cross-border good will and help assuage some of the tensions associated with one of the many laundry list of issues that continue to undermine stability in Mexico (e.g., drug trafficking) – a country whose national security is inextricably linked with ours. Photo: This map depicts the scope of the Border 2012 program as bounded by the La Paz Agreement. Courtesy of the EPA.